Start Shooting Better is back! 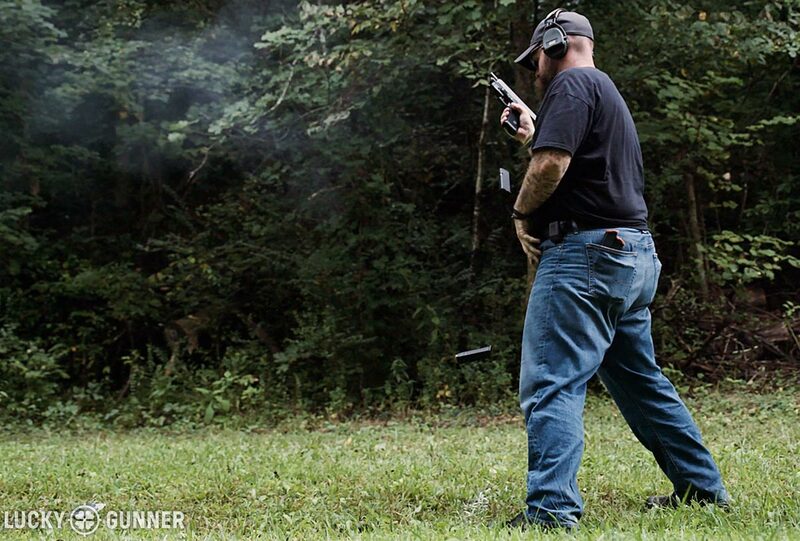 This episode features one of the oldest fighting pistol drills in existence: El Presidente. 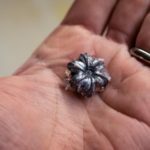 This is one of the tests Col. Jeff Cooper used to evaluate his students back in the early days of Gunsite Academy and it’s still a popular drill today. Watch the video below for a full explanation and demonstration of the drill, or scroll down to read the transcript. CHRIS: Hey guys, Chris here from Lucky Gunner. I am at the range again with John Johnston from Citizens Defense Research, also the host of Ballistic Radio. We’re doing another episode of our Start Shooting Better series and today we’re looking at an old favorite: the El Presidente, one of the oldest in the book. Why don’t you tell us how that goes. JOHN: Jeff Cooper’s famous drill. 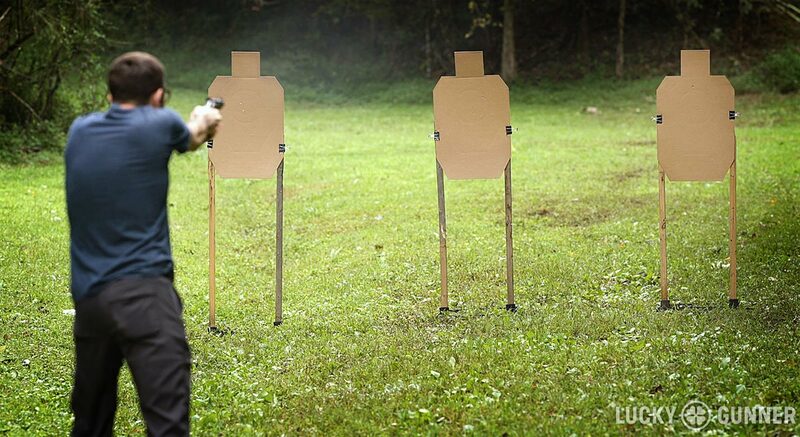 Start at 10 yards, facing away from the target with your hands in the surrender position. Three [IDPA or IPSC silhouette] targets that are a meter apart. On the beep, you turn, draw, put two on each target, reload, and then two on each target again, for a total of 12 rounds. What we’re working here is multiple target transitions, reload under pressure, and also fast acquisition of the sights on an unknown target. Even though you know where it is, you still have to turn and orient to it. CHRIS (VOICE OVER): Ever since El Presidente was first developed in the 1970s, the gold standard par time has been 10 seconds clean — that’s all 12 shots inside the 8-inch circle from concealment with everyday carry gear. 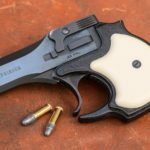 Today, there are plenty of high-level shooters who can clean it from concealment in about 7 seconds, but 10 is still a very solid time. Beyond shooting it clean, there have been several different methods for scoring El Pres and the speed at which you attempt to shoot the drill will probably change depending on what you decide the penalty is going to be for any misses. Sometimes it is scored so that only clean runs count and any misses are an automatic failure. For our demo runs today, we’re not going to be quite that strict. 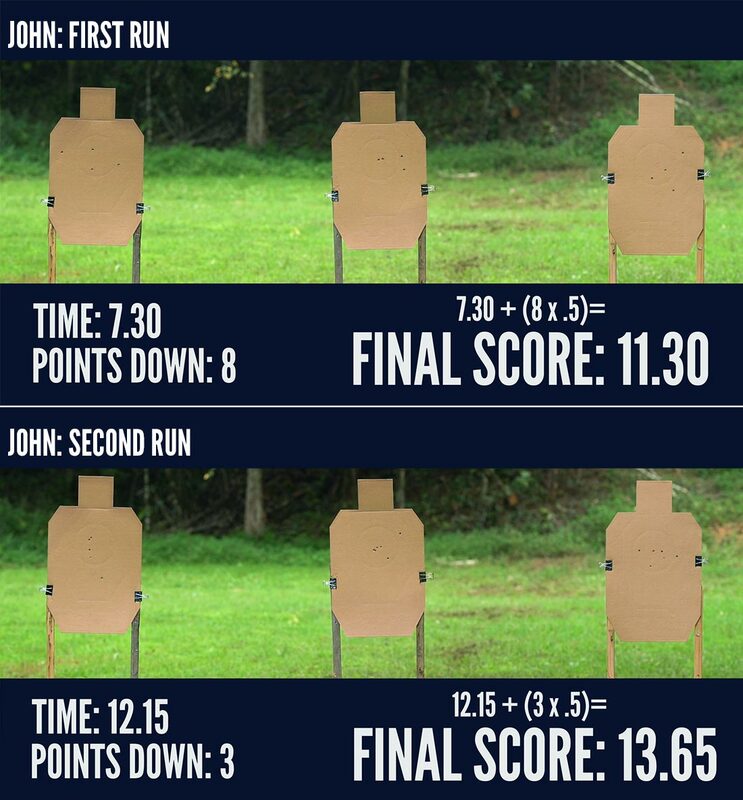 We’re going to use the old IDPA scoring system and add a half second to our time for every point down on the target. I should also mention that we’re not using El Pres as a tactical scenario. It’s not designed to teach a specific response to a violent encounter. This is technical drill to evaluate and work on specific marksmanship and gun handling skills. It’s really important to understand the difference between those two things. CHRIS (TO JOHN): So, we shot the El Pres today and, uhhh… yeah. It did not go well. We thought it might be a teachable moment, it’s also an opportunity for us to reiterate our policy here – that we don’t do any re-shoots on these. Whatever we do on our first run that gets on camera, that’s what you guys see. And it wasn’t our best. JOHN: No. My runs were really bad. My first run, my hits weren’t really great. I was slow. Mainly because, one, it’s not a flat range, and two, it’s not something I ever practice. I do not practice turning from surrender position, draw and engaging that many targets. So that was one of the reasons I was excited to work on it. On the second run, I decided that, due to the… dynamic critical nature of the incident that it was going to be most tactically sound for me to throw my reload on the ground. That’s what I decided based off of my read of the situation..
CHRIS: You made a judgement call. CHRIS: Right, you need to know how to recover once you’ve screwed up. JOHN: Yeah, exactly. And luckily, we got to work on that today. CHRIS: So my run actually went okay. I had some really good reloads and I was pretty happy about that. I was running a revolver on this one. Typically, the par time is about 10 seconds on this and usually, depending on who you ask, they’ll give you a couple of extra seconds if you’re running a revolver, which I didn’t know. So I was trying to just get those rounds out and on both runs, I threw one in the -3 zone, which, for me, is just completely unacceptable. That’s not cool. That’s a clear miss. JOHN: Yeah, and to be clear — and I know you already talked about this — one of the things that’s really important to me is — there’s tons of people that are online doing videos. And we can make ourselves look as cool as we want to if we edit these right. And everybody kind of knows that, but just understand, you can make yourself look like a rock star. When either one of us does not perform well, I think it’s good to know that we’re going to show it. It might be ugly, but we’ll show it. But the flip side of that is that when we show something where one of us has done well — well that’s just how it worked out. And you need to be honest with yourself, too, because if you’re not — if you’re not really hard on yourself and critical of your own performance, you’re never going to get any better. Everybody messes up, everybody fails, and that’s normal. That’s actually part of improving. CHRIS: That’s why we’re doing it. JOHN: Yeah, exactly, but if you can’t be honest and say “hey, this is awful, here’s what I need to work on,” then you’re not going to get any better. CHRIS: And to her credit, Melody Lauer ran it today with us. Her score was not great either, but she didn’t offer any excuses, so maybe she’s the best shooter of all of us. She owned it. CHRIS: Well, it was fun to do a drill that has something that none of us do very often and that’s the turn thing. I think that’s a good skill because chances are, you can’t guarantee you’re going to be facing the target and looking at what you’re going to be shooting right before you know you need to do it. JOHN: Right, and it’s, once again, putting yourself in novel situations and doing things that you are not comfortable doing is how you improve as a shooter. And if the only way you’re measuring your performance is off of drills that you get to pick, then what you end up doing is picking things that you’re good at all the time and not focusing on the things that you’re bad at. CHRIS: And that’s a good plug for doing some kind of competition shooting. But if you don’t do that — if you’re busy working on the weekends like a lot of us are, doing something like this — just changing up your drills to something a little out of your comfort zone is another way to do it. CHRIS (VOICE OVER): Before we wrap this one up, we thought you guys might want to see what a good El Presidente run looks like. 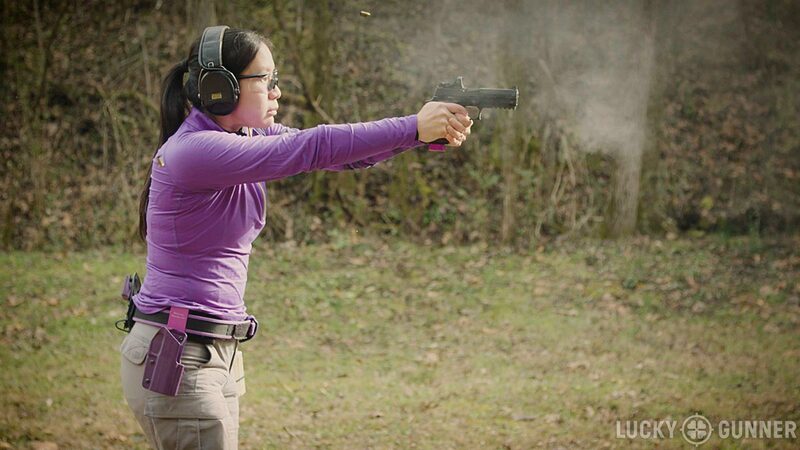 Our friend Annette Evans is a USPSA shooter and author of the book The Dry Fire Primer. She was in town recently and shot an El Pres for us with her Sig P320 competition rig. She ran it in 6.22 seconds with 4 C-zone hits. 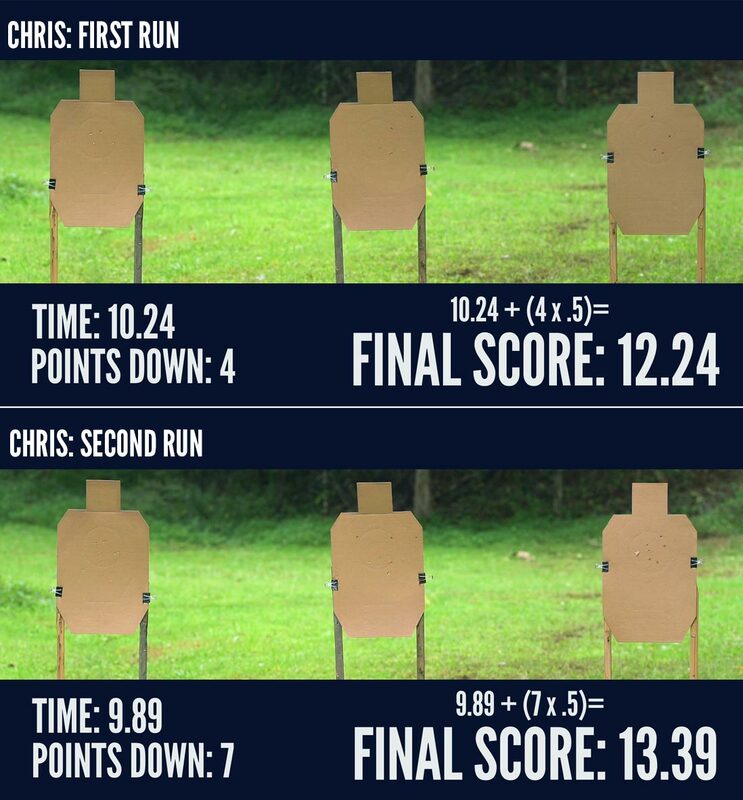 Using the USPSA scoring system, that is a 8.36 hit factor, which would be a solid A-class run. If you’ve got a range that allows it, figure out which scoring system makes the most sense for you, and try out the El Presidente. Follow Lucky Gunner Lounge from your Inbox!